here is a fun photo of nick and me in action on the drums. we were lucky enough to get a lesson during our final soiree the evening before we left tobago. 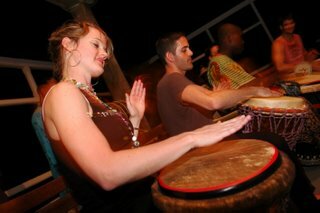 i was a bit rigid on the drums but loved the tribal experience of the instrument. as someone said to me today, it connects you to your core--kinda like a heartbeat. what's not to love? if you haven't experienced live drumming or played with one yourself, i highly encourage it as it was a true highlight of our adventure on that very special island!